Editor and, perhaps, author; lived in the sixteenth century. He edited the "Maḥazor Sefardi" (Venice, 1584); and a Jewish calendar for the period 1585-1639 was printed the same year at Sason's expense. 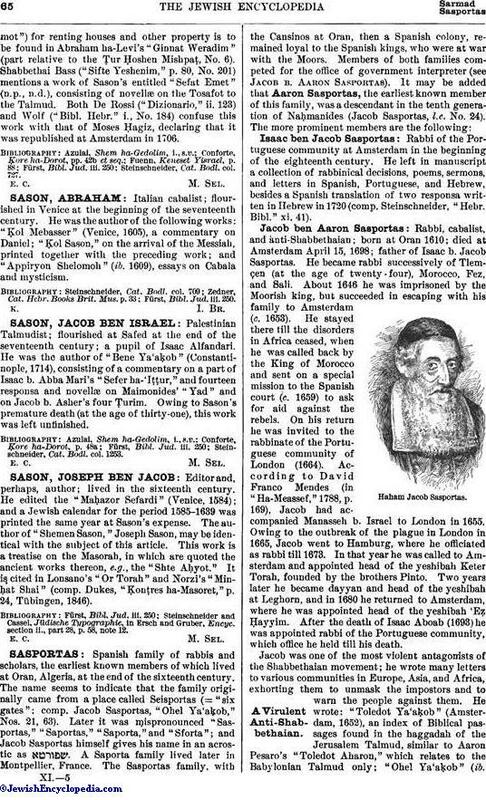 The author of "Shemen Sason," Joseph Sason, may be identical with the subject of this article. This work is a treatise on the Masorah, in which are quoted the ancient works thereon, e.g., the "Shte Aḥyot." It is cited in Lonsano's "Or Torah" and Norzi's "Minḥat Shai" (comp. Dukes, "Ḳonṭres ha-Masoret," p. 24, Tübingen, 1846). Steinschneider and Cassel, Jüdische Typographie, in Ersch and Gruber, Encyc. section ii., part 28, p. 58, note 12.